Long before the incandescent (very bright) electric light bulb was invented, arc lamps gave birth to the science of electric lighting. When the first large batteries were being built in the early 1800s, researchers noticed that electric current would leap across a gap in a circuit, from one electrode (a terminal that conducts current, such as an anode or cathode in a battery) to the other. The result was a brilliant light. Collier and Baker patented this electric arc lamp design in 1858. English chemist Sir Humphry Davy (1778-1829; inventor of the miner's safety lamp, also called the "Davy Lamp"; elected president of the prestigious Royal Society in 1820) is credited with discovering this electric arc and inventing the first arc lamp, which used carbon (a non-metallic chemical element found in many inorganic and organic, or living, things) electrodes. Until the development of the dynamo electric (having to do with the production of electrical energy from mechanical energy and vice versa) generator, the arc lamp was merely a curiosity. It required expensive batteries or generators to operate, and was difficult to control because the light fluctuated too much. 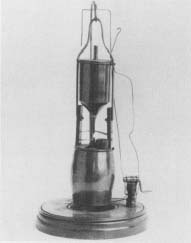 In the latter part of the nineteenth century, improvements were made to the controls and electric current for the arc lamp, but newer inventions—including the incandescent light bulb and discharge lights (such as mercury vapor light and fluorescent lights)—were able to provide consistent light without the excess heat of arc lamps. The arc lamp has found a home for the future, however, in support of certain medical procedures. Lasers and arc lamps often work together to help stop chronic (recurring or happening for a long time) nosebleeds and other non-healing wounds. In addition, arc lamps are used in laparoscopic surgery (where small incisions are used and a small video camera guides the surgeon) to provide light for the procedure.